Okay, back in business. We are almost into December, and a mere 2 months away from the announcement of the 2012 Oscar nominees. Has anything changed since my previous posts? Well, yes, but nothing too fundamental. In fact, the most fundamental change is probably that Brett Rattner is no longer producing and Eddie Murphy is no longer hosting the ceremony next year. Basically, Brett Rattner stuffed it all up with a statement that went a little something like "rehearsal is for fags". Murphy then withdrew in solidarity or something. It's all very gossipy and not my thing, so read more here if you like. Rattner and Murphy have been replaced by Brian Grazer and Billy Crystal respectively. Hell yes! Billy Crystal is my favourite ever Oscar host, and it's great that he has agreed to return next year. Anyway, hit the jump for some updates. "Ever since Saving Private Ryan, the work of director Steven Spielberg has been hit-or-miss. Finally, our wait for the return of his classic touch is at an end with War Horse, both a model of cinema done right and – even more importantly – the epitome of Spielberg done right. Seeing something as brutal, terrible and human as war through the innocent eyes of a horse is an ambitious form of storytelling, and Spielberg pulls it off with honesty and authenticity. I felt each emotion as if I was a marionette, manipulated by the director’s strings. The most telling scene, set in No Man’s Land, involves a German and an English soldier, a pair of wirecutters, a horse and a casual conversation about home. It reveals what makes this a movie that will be watched generation after generation, with each one crying and cheering in the same places. It has all the hallmarks of the Spielberg we’ve missed so much: powerful, gutsy, honest, and effective." There's more... Slashfilm editor-in-chief Peter Sciretta tweeted "War Horse was a great, beautiful, moving film"; and Awardsdaily's Sasha Stone said "I cried throughout War Horse. I cried the way I cried at the Kite Runner, A Beautiful Mind, Sophie’s Choice, Terms of Endearment and I must say, The Descendants. It’s hard not to cry when such a beautiful animal is used to illustrate such a brutal war." That does not mean it is a perfect film though. It had to have those elements that so often spoil a Steven Spielberg movie for me, where he tries too hard to drive a point home, not letting the movie do it for him. Maybe it's for those audiences. I will say no more. Whether I am going to like this film or not, I think it is going to be very difficult to beat come Oscar season next year; and I don't think that The Descendants or The Artist will be front runners for very long. You have to start doubting your sure bets when you have a subcategory for "other" sure bets. Anyway, I still think that Moneyball and The Help will be nominated, especially now that I've seen Moneyball. However, I don't think either film will win. Both have been in circulation a while now, so nothing much will change here. One film that is still a bit of a mystery though is Extremely Loud and Incredibly Close. There is still no word on how it is. Does the fact that nobody has seen it mean that perhaps it is being held back because it is not that great? This happens very often, but in this case I think it's still too early to tell. We will have to wait a little longer. 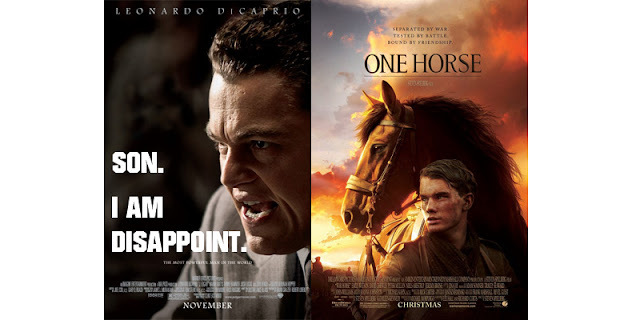 State of the race: J Edgar has disappointed as feared, but will War Horse make this a one horse race? "Leonardo DiCaprio gives a predictably powerhouse performance, but J. Edgar stumbles in all other departments with cheesy makeup, poor lighting, confusing narrative, and humdrum storytelling." "Hugo is an extravagant, elegant fantasy with an innocence lacking in many modern kids' movies, and one that emanates an unabashed love for the magic of cinema." Ignore Scorsese at your peril. ... things stay the same. Even though I have been seeing positive buzz for films like Young Adult and Shame, I don't think there is enough there yet to render these Likely Contenders. Both seem set for some acting nominations (Michael Fassbender for Shame and Patton Oswalt for Young Adult), but we will need to see what happens after release before anymore should be said. Penultimately, the first reviews have been trickling online for Cameron Crowe's We Bought A Zoo, and things are looking good. However, it's also still too early to tell. A possible nomination I think, but no wins here. As for the other movies I listed previously, there really is no change at this stage. The Girl With The Dragon Tattoo; Tinker, Tailor, Soldier, Spy; The Ides of March; Midnight in Paris; The Tree of Life; Take Shelter and Martha Marcy May Marlene remain just where they were.